The losses were piling up like the snow along Utopia Parkway. This first season of Chris Mullin’s reconstruction project at St. John’s has been anything but utopia when it comes to the record. But here was the Red Storm, on the day after the extra-large snowstorm, making an extra-large comeback. 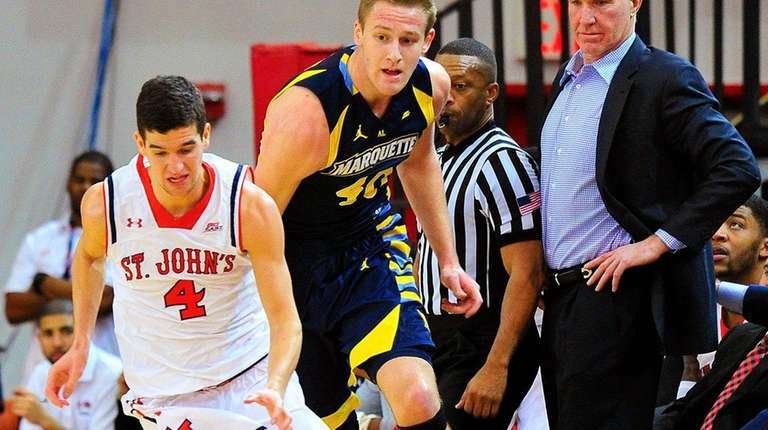 St. John’s was looking up from the bottom of a 20-point crater four minutes into the second half of Sunday’s makeup game against Marquette at Carnesecca Arena after Saturday’s Garden snow-out. But these players in the home white started climbing. “You’ve just got to believe,” said Durand Johnson, the St. John’s swingman and grad student. The lead shrunk to two with 5:59 left, and it was just three with 41.5 seconds on the clock. But in the end, the Red Storm owned another loss to throw on the pile, a 78-73 decision that extended its program-record streak of defeats to 10 games. Duane Wilson (17 points) and Henry Ellenson (16 points, 18 rebounds) paced the Golden Eagles (13-7, 3-5 Big East). Johnson scored 20 points off the bench for St. John’s (7-13, 0-7). St. John’s freshman point guard Federico Mussini scored all 19 of his points in the second half. And freshman forward Kassoum Yakwe, out of Our Savior New American in Centereach, contributed seven points, eight rebounds and a career-high seven blocks. The Golden Eagles, who had dropped three straight after beating the Red Storm in Milwaukee, led 76-73 when Mussini went for the tie as the clock streamed under five seconds. “I thought it was about to go in because from what I was seeing, it was straight on,” Mussini said. But the ball arrived short, hitting the rim. Ellenson grabbed the rebound, got fouled at the 1.1 mark, hit both, and that was it. St. John’s made Marquette melt under the heat of a press to get back in it, outscoring the Golden Eagles 33-15 to trim its 20-point problem to 61-59. “I think our guys got a little nervous,” Wojciechowski said. Johnson nailed two threes in the final minute to make Marquette sweat even more. The Golden Eagles had led 46-26 after closing the first half with a 9-2 run and opening the second with a 15-3 burst.